Beautiful view of Zaton Bay (Adriatic Sea) from the balcony, and just a fifteen minute drive to Dubrovnik's Old Town. Zaton is a charming village which has great swimming areas and restaurants. Beaches nearby. Villa Rosa (my place) is set on two parcels of land and is surrounded by Italian Cypress trees. There are Oleanders bordering the front garden with Olive trees and citrus trees. A hammock hangs between two majestic Cypress trees. Help yourself to seasonal herbs, figs and raspberries. BBQ in the garden. Grocery store near by. Very private location. Ample Parking. Apartment nicely decorated. Second bedroom is in detached guest cottage. Linens/towels provided. Keywords: One bedroom apartment sleeps up to 3 (or 5 if you rent Cottage). Kitchen fully equipped; shared terrace with spectacular views; Two minute walk to the sea and great swimming. Great restaurants within walking distance. Grocery near. Also see 363116 twin apartment available. Airport pick up and drop off services available. Bedrooms have AC; no AC in living room/sleeper sofa; if just the detached cottage(no kitchen) just 45 Euros sleeps two. AC, fridge. I am a Chicagoan who came to Sarajevo in 2001 to work with ABA/CEELI for one year. Visited Dubrovnik that first summer and decided that this was the place I wanted to live. Bought my place in 2003 and built the additional apartments in 2008. Have traveled widely and also spend a fair amount of time in Ireland. I enjoy cooking, swimming, hiking, music and interesting conversations over some good wine or home-made cordials. Great place to kick back and relax. I never tire of the views of the sea. Changes every day. At times, the birds sing night and day. Only one neighbor to the south of me and they only come occasionally. Olive groves to the south and Italian Cyprus behind me. A two minute walk to the sea - great way to start the day with a swim; or walk up into the hills behind me for a more strenuous form of exercise. Two first-rate restaurants within walking distance - 20- 25 minutes away along the coast. Elefiti islands are quite nearby.Bus stop just across the street will take you to the bus station in Gruz. Great Grocery store one minute walk. Great view. Nice apartment, very well connected - you can easily get to Dubrovnik or nearby villages (Trsteno highly recommended). A bit noisy because of the road in front of the house, but still worth staying! Thank you for choosing Villa Rosa. I'm happy you enjoyed your stay. Yes, I agree Trsteno is a must and so close. Michael, the owner, is on site and is an extremely helpful, knowledgable and welcoming host. He really goes the extra mile to ensure that his guests have a memorable holiday. The apartment was comfortable and everything was as advertised. A great place to stay and very convenient for exploring the area and surrounding countries. Highly recommended as a base. There is a small supermarket next door which is very convenient. Thank you for the great review. I enjoyed meeting you and having drinks on the terrace. You were most enjoyable guests. Spent two weeks here recently. 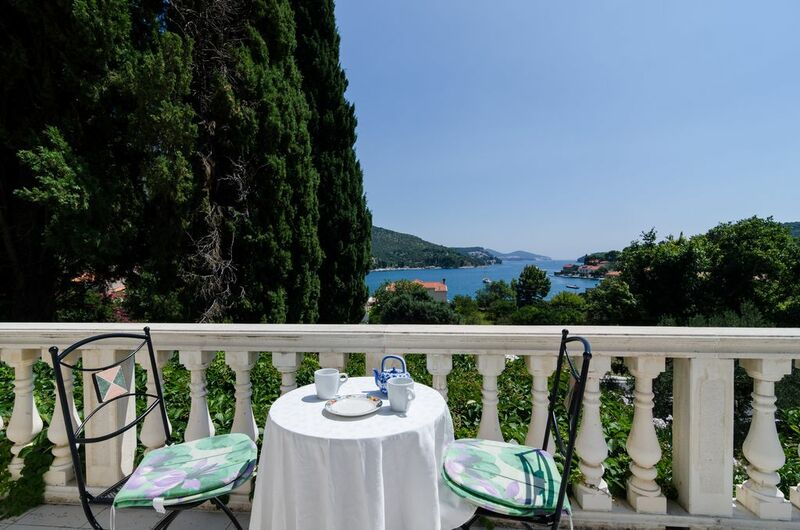 The view from the balcony is amazing, The location is excellent, near enough to Dubrovnik to visit regularly via taxi.short walk to well stocked supermarket, sea and local restaurants. Michael was the best host, providing dinner on our arrival, after he saw our flight was delayed, and on hand to ask questions whenever required. We had the perfect balance of relaxation and exploration . We hired a car and visited Montenegro, Bosnia and the surrounding area. Both Kotor bay and Mostar are 'must sees'... We stayed over for a night in Mostar at 'Villa Mike' which was a much needed oasis after the long winding drive there. We visited Kravica waterfalls from here, another 'must see' . All in all a fabulous holiday and cannot wait to return to this amazing part of the world. Thanks for the great review. You and your daughters were great guests. It was a pleasure to host you. Your enthusiasm for the region renewed mine. Thank you for your patronage. Disappointed, important info missing from listing, cleaning issues. We chose this apartment based on the price, the view and the reviews. Unfortunately it did not live up to our expectations. The listing fails to mention the main road that runs in front of the property which is the road between Dubrovnik and Cilipi airport. This means that it is never without traffic and the noise is constant, even with the windows closed and who wants to keep their windows closed? There is one other apartment on the same floor and the walls must be fairly thin as someone in the next apartment appeared to have a troublesome night-time cough which we could hear every night while they were there. After they left and another party arrived, the new party proceeded to sit on the balcony outside our french doors as there is nothing to divide the shared balcony. Perhaps some kind of divider could be installed to prevent this happening? We felt that we couldn't even have the shutters or windows open because they could look right in and did actually walk in to our apartment on one occasion.The listing also fails to mention the steps to the property (it is on the first floor of a two storey house) and there is an upwardly sloping path with a few more steps leading up it. This wasn't an issue for us but it would be for someone with mobility problems so should really be included in the listing. And lastly, cleaning issues: it was apparent that cleaning had not been carried out fully before our arrival. The inside of the microwave had stale food stuck to it and the shelf around it was also dirty. The fridge had spill stains and a dead spider inside it. The crockery inside the cupboard felt sticky and the cups were tea stained. I felt like I had to wash everything before I used it. On the plus side, the proximity to the airport and to Dubrovnik makes getting around very easy. There were little extra items in the apartment that were appreciated: extra pillows and towels in the wardrobe, washing up liquid and sponges in the kitchen. Mentioning the road and steps in the listing and a little extra attention to detail when cleaning would make all the difference and is easily remedied. The couple were uncommunicative from the beginning. Not sure why the review is so negative; I personally cleaned the apartment before their arrival including the refrigerator. It was clean. There were beers in the frig for them but neither of them drank alcohol. The microwave - perhaps i did not check that. I am sorry they found their experience here negative. Instructions from the airport clearly state my place is just off the main road. Pictures of the place include the steps going upstairs. I believe in truth in advertizing. The couple in the other apartment told me that they said hello to the woman who turned and walked into her apartment without responding. Please read my other reviews; you'll find most people disagree with this review. We rented the 2 apartments in October from Michael. They were just what we wanted, great location, clean and what a view. Michael was very knowledgeable about Dubrovnik, restaurants, boat tours, food, things to do and see. It was just perfect. He is so friendly and willing to take time to answer our questions. We will be back. Thanks again Michael. I can help you plan your stay. Great drives to Sarajevo, Mostar, Montenegro etc.. Wire tours with Mario. Kayaking with Tammy. Fish picnics with Milo or rent a boat from him. Sailing with Mary Anne.